Hotel Brightland is the oldest hotel in Shimla, a former summer Capital of India during British period and now the capital of Himachal Pradesh. Shimla is India’s largest hill station and also crowned with “Queen of Hills”. Hotel Brightland is situated in the heart of city and one of the oldest hotels. The hotel is located at the prime location that’s why it is accessible to all places of interest. Railway station, mall road and bus stand are at a walking distance from the hotel Brightland. 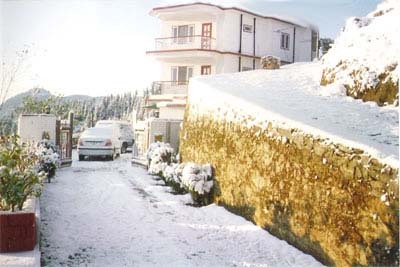 The surroundings of hotel are covered with hills and pine trees. Hotel Brightland offers a comfortable stay in 59 well furnished rooms with all modern amenities and deluxe facilities. Each room is designed differently with all modern facilities that offer you a different experience in every room. Most of rooms are valley facing rooms from where you can enjoy the panoramic views of valley. Well cleaned washrooms are attached with all the rooms. Mini refrigerator is also available in few rooms. For recreation you can also enjoy your evening at the terrace garden of hotel Brightland that leads to inner peace. Hotel Brightland is a two star hotel and has a multi cuisine restaurant that serves a variety of Indian, Chinese and Continental dishes. Room service is also available for the convenience of guests. Sunrise Travels Shimla team visited hotel Brightland personally and found that all rooms are well maintained that gives a royal touch and comfortable to stay. The hotel is best in cleanliness. Well trained staff and good hospitality worth the value you pay for. Actual photographs taken by our Travel team are displayed above on the right side.